It will take a player of incredible talent to knock Michael Jones from his spot as the greatest openside-flanker of all time. Richie McCaw is not there yet. Jones revolutionised the position with his physical prowess, superior fitness and instinct for the ball, but while he was a joy to watch his career was often punctuated with time away from the field because of injury and his refusal to play on Sundays for religious reasons. Jones ensured his legacy from his debut at the age of 22 when he scored the opening try of the inaugural World Cup in 1987. He went on to play a major role is securing New Zealand the title. When he was on the field he was sublime. He had pace, athleticism, ball skills and a punishing tackle which quickly won him acclaim as one of the most gifted rugby players of all time. Despite being a bruising forward he had the vision and speed of a back. In one of the World Cup pool matches against Fiji he showed the finesse and judgement of a centre in setting up a try for his winger, Craig Green. Much to coaches and spectators' disappointment, Jones had career marred by injury. He suffered a serious knee injury during a match against Argentina in 1989 which ruled him out for nearly a year. He returned at the end of the 1990 season and was taken to the 1991 World Cup despite concerns over his availability for Sunday matches. He scored in the opening match against England at Twickenham but the All Blacks would learn that his strict beliefs would become a problem when he was unavailable for three matches during the tournament and was not selected for the 1995 World Cup because the quarter and semi-finals were scheduled for Sundays. 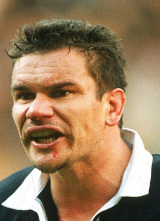 In the mid-1990s Jones switched from openside flank to the blindside, both with Auckland and the All Blacks. He coped well with the physicality and the All Blacks benefited from his strength, commitment and bullish tackling. With Jones wearing the No. 6 jersey in 1996 New Zealand scored a record 43-6 win over the Wallabies at Athletic Park, won the inaugural Tri-Nations title and won a Test series for the first time over the Springboks in South Africa. Jones suffered a broken jaw and another serious knee injury and recovered from both, but by 1998 and aged 33 it was becoming clear that the effects of his many injuries were beginning to take their toll. Rarely for Jones he was dropped from the All Blacks side of 1998 and missed the final two Tests of the season. His final international was against Australia in Christchurch on August 1. The Wallabies won 27-23. Even though his on-field career was winding down Jones added the 1999 NPC title with Auckland and played for the Auckland Blues in that season's Super 12. Jones ended his playing career with 55 Test caps for the All Blacks, a relatively small amount compared with his contemporary Sean Fitzpatrick who numbered in the 90s over the same period. Jones scored 56 points - 13 tries - in internationals and a total of 69 points (16 tries) from 74 matches in the black jersey. In 2004 Jones turned attention to coaching and took over from John Boe as the coach of Manu Samoa, a country of his descendents and a side he played a Test match for once in 1986 before he was selected for the All Blacks. After assisting Boe at the 2003 World Cup, Jones took the proud island nation to France in 2007 but encountered possibly one of the most demoralising times of his professional life. The Pacific Islanders produced one of their worst performances at a World Cup, losing to Tonga, their island arch-rivals, for the first time in seven years. Jones resigned at the end of the tournament. It will not be the coaching that Jones will be remembered for, however. A constant fixture on all-time greatest list, Jones made his mark as a player who would punish his opposition on the field but was the first to shake their hand as soon as the final whistle blew. It will take a lot for Jones to be forgotten.